Reviewing research to write a future post for Metschers’ Musing, I stumbled upon a case study I wrote about successful online community management. After reading it again, I thought others would appreciate the tactics needed to build successful communities focused on the clients’ real needs. I wrote this about a year ago, but some of the tactics still hold true today. Why the need for Online Communities? With the rules of traditional communications and marketing changing, more companies are looking to digital communications tactics to help drive customer acquisition and loyalty. And it is for good reason. According to CEB, 57 percent of prospects are conducting research prior to the sales conversation. Forrester in 2008 summarized the importance of online communities as one of the most powerful tools a marketer can deploy for customer retention, word-of-mouth, and customer insight. Some companies have embraced real-time input from the market and customers by building communities where customers can come together, exchange ideas, communicate frustrations, and truly foster two-way communication. However, many companies are challenged with how best to manage the community where it has no control over the conversation and cultivate a space where customers come to engage. Eloqua built an open peer-to-peer forum for marketers and customers called Topliners in 2010. For those unfamiliar with Oracle|Eloqua, Topliners focused on marketing, sales, and improving topline revenue where members find peer support and ideas to meet common challenges. Know their customers. Eloquans, what Eloqua customers are called by themselves and the company, are hyper-engaged and tech savvy. Most marketers buying Eloqua buy into this concept of ‘modern marketing’, which means that traditional marketing methods will no longer work in customer acquisition. The community is very active and uses a gamification platform to support engagement. Planned for engagement. Building an online community that is a trusted resource takes more than technology; you need to plan for building content and engagement. Eloqua did not have a “build it and they will come mentality.” The company planned out the content for the site (see blog post), leveraged brand advocates to seed content, and talked with customers on the type of content they wanted to see in the community. Truly customer-centric. Since revenue performance management and marketing automation is in the nascent stages, most customers not only need help with implementation, but also how to change their overall marketing approach. The company’s strategy has always been how to answer the question, “how do we make our customers successful?” Eloqua has become a trusted resource and curator of quality content that is used and shared by many clients, prospects, and industry influencers. Advocates drive the content on Topliners with blog posts on using the solution, uploading helpful documents, starting discussions, and posting polls. The site also uses gamification technics such as badges and level designation to improve user experience. Members can earn certain badges for posting content and other activities such as Overachiever, Share Your Flair, and fifty other types. The point of members’ badges and levels? Incentives your strongest advocates to share their knowledge and best practices and reward them with virtual recognition. So was it successful? In a follow-up post, Eloqua shared that the community experienced a 55 percent lift in average active users in the first month after the launch. Since implementation, Topliners continues to grow in activity and engagement. But is Topliners Retuning on the Eloqua’s Investment? According to its submission to Forrester’s Groundswell Awards 2013, its customers who use Topliners renew at a dramatically higher rate than those who do not — 87 percent. They also submit less support cases and issues. Topliners contributes to reserving customer support references, drives sales, and builds engagement amongst users. Many companies are looking for better ways to engage with customers online as customers are researching more information online prior to purchase. Eloqua has created a community and social embassies that energize its base to evangelize the brand. Without too much corporate speak, Eloqua has created a word of mouth marketing platform built on conversations and strong relationships with its current customers. Like most corporate marketers, I am always looking for ways to promote my company’s content on different channels. With limited resources and pressure to capture your audience attention, marketers need to be vigilant on how to cut through the noise. Paid, earned, owned, and shared media may sound foreign to some marketers, but smart marketers are using these channels to their advantage. Based on my past experience with paid promotion, I like to share how you can promote your next campaign using paid media. In content marketing, the campaign in my mind doesn’t finish when the content is created, but when it’s ready to distribute and promote. I wrote extensively on the importance of distribution and paid in my previous post on the Seven Ugly Truths about Content Marketing. Promotion is key now more than ever. The Internet has made your customers more savvy. On average consumers are reading 10.4 pieces of content before making a purchase. How to you make sure they find your content? Answer: You need to have a paid strategy for your content. So what is paid promotion? 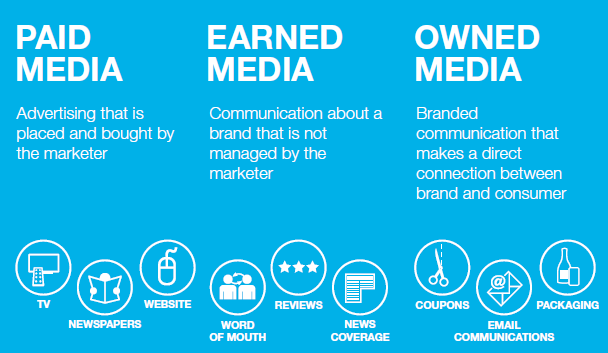 Jeremiah Owyang from the Altimeter Group, wrote about the concept of paid media in the report, The Converged Media Imperative: How Brands Must Combine Paid, Owned & Earned Media . CliffsNotes version on Paid: paid promotion is when you pay to promote your content. You can read more examples on paid such as native adverting, here. Why don’t more organizations use paid? Lack of understanding and reliance on their own channels. 4) more importantly wants to know about. Promote webinars on our site is a given. We promote our webinars on our social media channels and through our newsletter. Check and Check. But, attendance was stagnant. It was time to turn up the dial. Through research, I found publishers in our industry that were trusted and great pubs where our customers go for information. We worked with the publisher on two experiments, one where we just use their promotion channel and the other where the publishers work with our expert to host a webinar. Research publications. I knew we needed to promote our content, but I wasn’t sure what publishers we should partner with. I asked our experts, I did my own research, and I monitored on social media what folks where sharing online on their own channels. Experience the publisher’s outreach program. I opted-in to publisher’s newsletters, alerts, and promotional emails to check out frequency and content. I think this is a crucial step. You need to know how your prospect will receive and consume content. You don’t want to partner with a publisher who over-sends promotional email or alerts. Attend webinars and/or download whitepapers. Again this is to experience the journey just like your target audience. I like to know how folks are consuming content and how easy/hard it is.to access information. Remember the paid promotion around the hosted webinar I mentioned earlier? The results around this are still coming in, but we have been able to exceed the success of our first campaign. Make sure to have executive support. Measure your results and report. What would you add to the paid promotion best practices?